Prof. Tom Perera Ph. D.
This page presents CORRECTIONS and UPDATES and USER SUGGESTIONS for all editions of the CD. as well as CURRENT ORDERING INFORMATION. ** The most RECENT UPDATES are at the **TOP** OF THE PAGE. There are several ways to find the last REVISION DATE for your CD. 1. It should appear on the label of the CD. 2. You may click on VIEW/SOURCE while viewing go.htm and look at the date at the top of the page. "Please EMPHASIZE the importance of allowing ALL pictures to load before proceeding." "When you click on any Link from the Main Page, remember to Click ''BACK'' to return to the SPOT YOU LEFT on the Main Page." Historian Mark Baldwin has pointed out that the German Instruction manual for the Enigma seems to direct that the Ring Settings of the Rotors are to be set AFTER the rotor order has been determined AND AFTER the rotors have been placed into the Enigma. However, it is quite difficult to make these settings while the rotors are in the machine and Enigma operators may have elected to make the ring settings while the rotors were outside the machine. The reenactment video included in the CD shows the reenactors setting the ring settings on rotors while they are outside the machine and this may be an error. On my next trip to Germany, I am planning to ask a number of ww-2 German Enigma operators what procedure they used. Updates include insertion of the ENIGMA reenactment video, and descriptive videos of the M-209, NEMA, and FIALKA. Removal of all high resolution very large size photographs made room for the videos. Fialka and M-209 simulators were added. **The large, high resolution photographs are still available by purchasing the 3rd. Edition CD. They are useful for extreme enlargement to study details and for publication in books. The Early Code Wheel in the section of the CD entitled: "18 Historic Code Wheels and Devices at NCM" (The National Cryptologic Museum collection) that was identified as: "Very Early German Code Wheel" is actually a 'Very Early Danish Code Wheel made in Denmark around 1915 by Alexis Kohl. My thanks to Niels Faurholt for this correction. Russian Fialka Reflector and Input wheel photographs were switched. The closeups of the Fialka M-125-MN and M-125-3MN reflectors and input rotors were switched. Correcting this error reveals that the statement that the reflector from the M-125-MN Fialka has THREE wires coming from it is wrong. It has only 1 wire. Correcting this error also reveals that the statement that the reflector from the M-125-3MN Fialka has ONE wire coming from it is wrong. It has THREE wires. April 22, 2005: Modifications for MAC compatibility. The main part of the disc is totally MacIntosh compatible. In keeping with the philosophy of OSX, it does not autostart. To start it, use 'FINDER' to locate the go.htm file in the main CD folder and click on it. This will bring up the main page and permit direct menu access to most links. All of the files and functions that are in sub-directories or sub-folders will need to be accessed by 'FINDER' directly; rather than through the main menu links. For instance, the actual M-209 manual is in sub-folder m209 and the file which must be accessed is m209man.htm. EXAMPLE: To view the M-209 manual, first click on Main Menu or Table of Contents item number 16. You will get an error message saying that your MAC [can not find: /\m209\m209man.htm]. Take note of the location (the m209 sub folder) and name (m209man.htm) of the desired file. Then navigate 'FINDER' into that sub-folder (m209) and click on the desired file (m209man.htm). NOTE: This and the next example are based on the menu items and item numbers in the latest (3rd) edition of the Enigma CD. If you have an earlier edition, the menu item numbers will be different and these items will not be in the CD but the navigation principles will be the same. Here is another example. If you want to go to item 20 in the main menu, the Manual for the Russian FIALKA, click on the link in the main menu and note the error message: [Can not find /\mfmanj\mfmanj.htm]. This tells you that the desired file: mfmanj.htm is in the mfmanj sub-folder. Navigate 'FINDER' to the mfmanj sub-folder and click on the mfmanj.htm file and you will see the manual. As far as I can tell, the two Enigma simulator programs (Menu items 48 and 49) are the only items that will not work on a MacIntosh. Added complete Fialka Operation Manual. Added a dozen new photographs of the American M-209 cipher machine. Added complete M-209 operation and maintenance manual. Added Original 30 minute WW-2 Training film for M-209 cipher machine. Added 100 photographs and descriptive titles for the newly acquired Russian FIALKA Cold War Era Cipher Machine. Added 80 photographs and descriptive titles for the newly acquired multilingual keyboard model Russian Fialka Cold War Era Cipher Machine. Linked all of above into the main menu. Added 30 photos of German Navy Kriegsmarine M4 4-rotor Enigma. Added 14 photos of another Kriegsmarine M4 4-rotor Enigma. 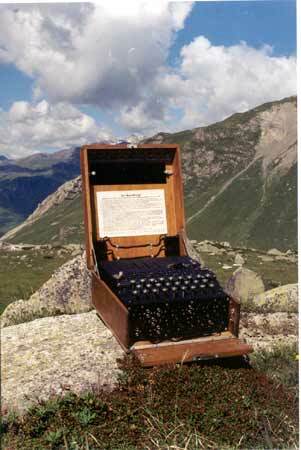 Added photo of Russian Cipher Machine. Revised main page & museum page index links and included the above. Replaced Dr. Hamer's Rotor Wiring Data with corrected version. Corrected comment that Model G Enigma had the first plugboard to read that the model G Enigma had no plugboard. Corrected date of publication of Dr. F.L.Bauer's book from 1998 to 1997. Added Turkel reference as source of some of Dr. Bauer's photographs. Added Complete Internal Rotor Wiring Data for all of the standard Enigma rotors, the Abwehr Enigmas, the Swiss and Commercial Model 'K' Enigmas, the Commercial Model 'D' Enigma, the Railway Enigma, the Japanese Enigma, and the 'Norway' Enigma. Corrected typos. Corrected date of death of Hebern from 1920s to 1952. Added photos and description of a Brown Bakelite Rotor and a 'B' Reflector to museum. Added entire 58 page Archival Database of NSA/National Cryptologic Museum. Added entire 3200 item Archival Database of the Lou Kruh collection. Added Index Item 3: How to make Working Code Wheels. Added Index Item 4: How to make & use a Simplified Version of the Enigma. The enlarged versions of the pages showing Operation Ruthless have misnamed filenames and do not show up. Files: 562grb.jpg, 566lgrb.jpg, 568lgrb.jpg and 702tool.jpg were accidentally saved as 'filename'.jpg.jpg. (You may view these enlarged picture files by deleting the second .jpg in the browser URL window.) The problem has been corrected as of this date. "When you click to ENLARGE a photograph, you MUST click ''BACK'' to return it to small size and to return to the Main Page." "When you click to ENLARGE a photograph, sometimes it does not ENLARGE." You may order this CD from ARTIFAX BOOKS for $ 15.
plus $ 3 shipping in USA. TOTAL: $ 18 - Check or Money order. plus $ 5 in US funds for Air Mail Shipment anywhere in the World. Sorry but Artifax Books does not have the facilities for accepting credit cards other than through Pay Pal or foreign checks or currency. Click on BACK to Return to the Previous Page. (I receive over 200 spam emails each day. Please NOTE: You MUST include the word ENIGMA in the Email Subject Line.